We conduct your risk assessments and advise on all aspects of health and safety relating to COSHH and any other dangerous substances, professionally, cost-effectively and practically. 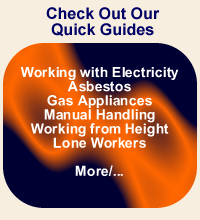 There are various regulations that cover dangerous substances in the work place, including the Control of Substances Hazardous to Health Regulations (COSHH) and the Asbestos or Lead Regulations. In providing a safe system of work and a safe place to work, all employers must conduct a risk assessment to ensure that any dangerous substances are used correctly and safely and that any workplace exposure limits (WELs) are not exceeded. For a guide as to what constitutes a dangerous substance see our quick guide. We will also conduct a Dangerous Substances Explosive Atmospheres (DSEAR) Risk Assessment. See too our Fire Risk Assessment. Why we would make an excellant choice as your specialist health and safety consultancy.